...Moses made a snake out of bronze and attached it to a pole. Then anyone who was bitten by a snake could look at the bronze snake and be healed! I have been thinking a bit about snakes in scripture recently. It was a direct result of yesterday's St Patrick's Day festivities. 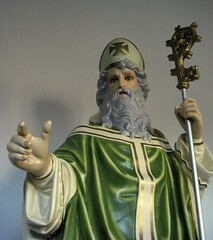 My Sunday School class was interested in St. Patrick and asked questions, since this particular saint has one of the most historically verifiable traditions of all hagiography (and a personal favorite of mine), I decided that he would make an excellent springboard for spiritual discussion. Granted, the legend that St. Patrick banished all the snakes from Ireland is not exactly a verifiable story. Granted, geologists are pretty sure that post glacial Ireland never had snakes, but it's still part of the legend and can still be used to make a spiritual point. Don't believe me? Read on! When snakes are mentioned in scripture, it's not usually in a positive light. The only positive reference to a serpent I can think of is when we are told to be wise as serpents and harmless as doves (Matt. 10.16). All other references seem to be negative. Throw in references to dragons and you've got a pretty grim picture of snakes. The very first image of a snake in most people's minds is probably The Serpent in Genesis 3. This chapter indeed sets the scene for the serpentine symbol in scripture (alliteration for the win!). Serpents are cunning and crafty. This serpent turned a Thou shalt not do it statement into a Thou shalt not pass this up mentality for crying out loud! Snakes are tricky, man! Enmity exists between The Serpent and The Woman. Mankind strives with Satan and often succumbs to his will. Numbers 21 gives us a very graphic, literal image of what takes place in the spiritual hearts of mankind on a daily basis. The children of Israel despise God's goodness, so he sends them fiery serpents as a punishment, and they begin to die as a result. The spiritual lesson here is unmistakable, unrepentant man despises God's grace on a daily basis. Every time he does so, he risks spiritual ruin. 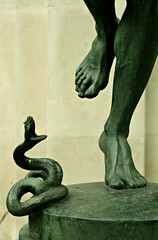 The Serpent is a symbol of the scourge of humanity, his struggle with sin and the wages thereof. These snakes bring about spiritual anguish and death. You know how God loves to take the weak things and confound the strong? He does the same with this topic of snakes (and thorns too by the way). We know from our Genesis 3 prophecy that The Serpent will bruise The Seed's heel, and The Seed will crush The Serpent's head. There is hope for the defeat of this scourge of humanity. In Numbers 21, a bronze serpent was constructed and lifted up. 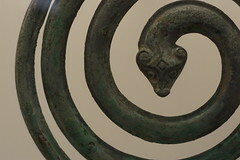 All who looked upon the bronze serpent were assured of full recovery from their poisonous wounds. Notice that the image to be constructed was in the same likeness as the punishment endured. This is critical. The cure closely resembles the disease. The Numbers passage is referenced in John 3 by the Lord Jesus. He claimed to be the fulfillment of that picture to Nicodemus. Except, instead of a pole, Jesus was on a cross and instead of a bronze serpent it was the Son of God and instead of snake bites Jesus was curing death. He cured death by dying. He defeated it by rising again. Mortality meets immortality. Humanity meets divinity. So The Serpent is crushed. It is brilliant and beautiful. Did St. Patrick banish snakes from Ireland? The naturalists will cast doubts on that, but as a Christian, I have to admit that he was a tool in God's hand to drive the curse of The Serpent out of Ireland. He was the first successful missionary to the island. Missionaries bring the message of the Gospel. Clearly, the antidote for the poison of spiritual snakes is the good news of Christ. It makes perfect sense to me. For that matter, we need more people who are willing to distribute the antidote. By the way, antivenom for snake bites are made by taking the venom from a snake, injecting it into a host and harvesting the antibodies from the host's blood. 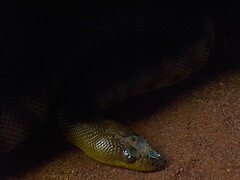 The antibodies from the host's blood are then injected into the victim of a snake bite, and should rescue them from peril. Do you see how this relates to Christ, who tasted death so that we would not have to? Does this not mirror the power in the blood of Jesus? I've heard of people who refused to celebrate or even acknowledge St. Patrick due to the fact that he was Catholic. I find this perplexing for one reason: St. Patrick's ministry occurred in the early 5th century A.D., the Protestant Reformation did not splinter the Church into denominationalism until the 16th century A.D. I am not certain that there was much of a choice in St. Patrick's time other than Christian vs. Pagan. The Common Librarian: Happy St Patrick's Day!